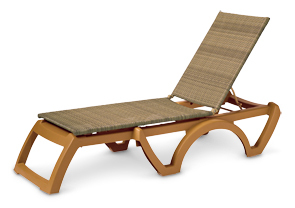 Java All-Weather Resin Chaise Lounge Chairs are extremely stylish and will exude luxury when lining the walkways of your pool area. The high strength VIRO® resin wicker fiber lounge back and seat is highly flexible for comfort, and is resistant to color fading, cracking, peeling, and breaking. It is specifically woven to provide a breathable surface in commercial outdoor environments, can be power washed when needed, and is easy to replace. 100% Recyclable and Built in the USA. Breathable VIRO® Resin Wicker Fiber. ASTM F1988-99 Rated to 300 Pounds. The solid one piece molded frame will sit perfectly on both hard sidewalk and sandy beach surfaces and is made of 100% first quality UV stabilized resin that is naturally impervious to salt, air, and most stains. 4-Position adjustable aluminum sling frame is powder-coated to match the resin frame. The recessed wheels make the lounge chairs easy to move and multiple chairs can be stacked for easy storage. Pair the espresso wicker with the bronze mist frame or the honey wicker with the teakwood frame to match your outdoor pool decor.